This is not a post tooting video’s horn. Everyone’s already done that, and by now we know it’s magnificent. Or at the very least, a valuable marketing tool. Adding a video to a landing page can increase conversions by 80%. And 70% of B2B marketers claim video to be the highest converting medium. Above all, this multi-sensory, engaging channel is good for a lot more than growing view counts on YouTube and general brand awareness. In fact, video is arguably one of the best lead gen tools, but if you’re letting your videos fade to black you’re not hitting them out of the park. There’s a long list of ways to use video for lead gen, but here are some of our favorite methods to get you started. 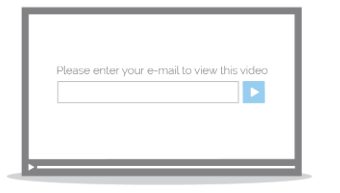 Pre-video gates are often short, one-field forms (generally email) at the start of a video. Viewers must fill in the form in order to access the gated video content. If you’re offering high-value video content (and that value is evident right off the bat to your viewers) you can add an email gate to the start of your video. By nature, these email gates sit at the very start of your video before any content is consumed, which means that the value should be explained through the copy on your landing page or the title of the video. Since it can sometimes be difficult to explain that value without showing part of your video, you can always give your audience a teaser and add a gate partway through your video to encourage more form completions. Check out how we did this in our on-demand webinar video by using two videos and chaptering them together. Sometimes gating an asset at the start of a video doesn’t make sense; think of using a video as a promotional tool for a higher value asset like a downloadable guide, for example. In this case, you’re not going to want to gate the video itself, but you can use a form at the end of your video to capture lead info and offer the download without requiring prospects to take any additional steps. Or, if you already have a form set up on your landing page, you can use a call-to-action to lead viewers directly to that form. We did this with the Video Marketing Handbook in the video below, viewers who click play above the fold will be re-directed to the form below the fold and encouraged to download the handbook immediately upon reaching the end of the video. 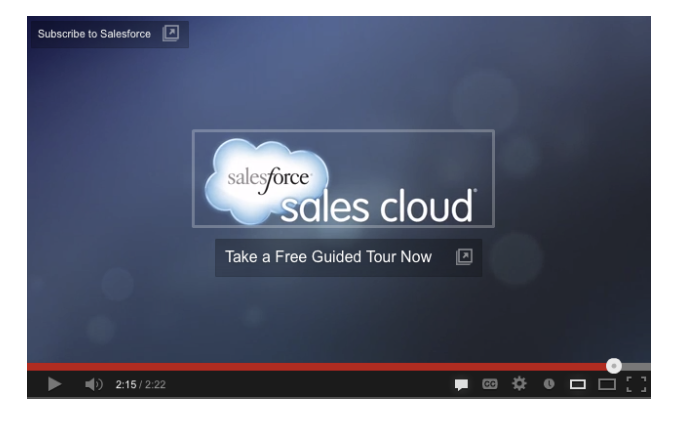 You can also add similar CTAs to your YouTube videos. While forms aren’t an option, YouTube annotations are text-based CTAs that can be added at different timestamps throughout your YouTube video. Talking about a specific guide or another video? Add one of these guys into your video at the exact time you mention the action and you’ll likely see higher engagement and follow-through. By thinking of videos as lead gen tools, and not as just a higher level brand awareness medium, you open your team up to a lot more lead collection opportunities. At Vidyard we split tested the effectiveness of adding a call-to-action alone, to the end of our home page video. Viewers who clicked on the CTA at the end of our video converted to trials at a rate of 21% versus 1% of viewers who didn’t get the CTA. I’d say that’s a win. Speaking of wins, we haven’t even gotten to the most exciting thing about video as part of your demand gen strategy. Video’s linear nature means you can track how much of a video your audience has consumed and where they’re dropping off. If you add this data into your marketing automation platform, all of a sudden you have a much greater view into which leads are hot and what they’re hot for.